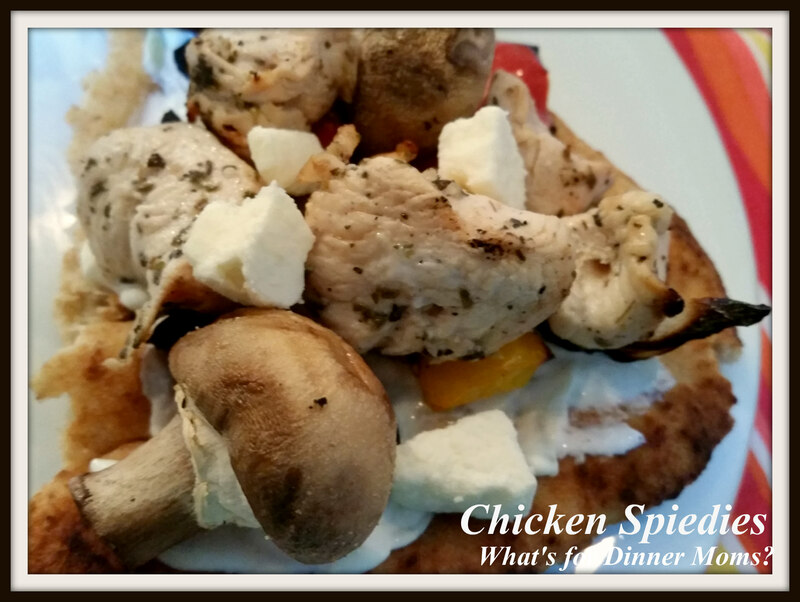 Chicken Spiedies – What's for Dinner Moms? *I receive no compensation or any free products for my review of this item. The product was purchased by me solely for the review of this product. These are my own thoughts and opinions and should be read as such. Spiedies are a sandwich from the Binghamton area of New York. Though the sandwiches are eaten mostly in Central New York but the sauce to make your own is available in most grocery stores in the Western and Central portions of New York. We haven’t had any in the past four years but on our last trip to New York two weeks ago we made sure to pick up some Spiedie Sauce at Wegman’s. A quick google search brings up several brands of Spiedie sauce that can be purchased online. 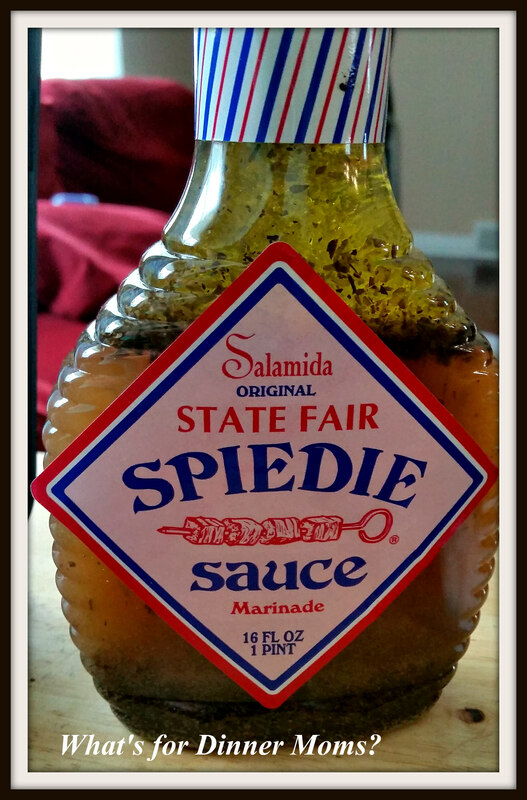 Our favorite is Salamida Original State Fair Spiedie Sauce. It has a delicious flavor that we love. The only thing I don’t like is that it has MSG. I need to start making my own sauce but using this sauce saves time. I pour it over the chicken, beef or pork in the morning and grill the meat in the evening. Couldn’t be easier. By the smiles and silence at the table I would say these were a hit. They have a vinegary, lemony flavor that brightens the whole dish. The chicken is super tender and tasty. Hint: When making Kabobs make single skewers of meats and vegetables. That way nothing burns as the other items are still raw. Onions take longer than tomatoes or mushrooms. Putting each on a separate skewer means that everyone can also take their favorite items and leave those they don’t like as well. We served this Tzatziki, Whole Wheat Naan Bread and Feta Cheese as a topping. We figured there were so many vegetables that we were okay without a salad. other veggies, as desired such as zucchini, squash, carrots, etc…. Marinate meat in sauce from 2 hours up to overnight. 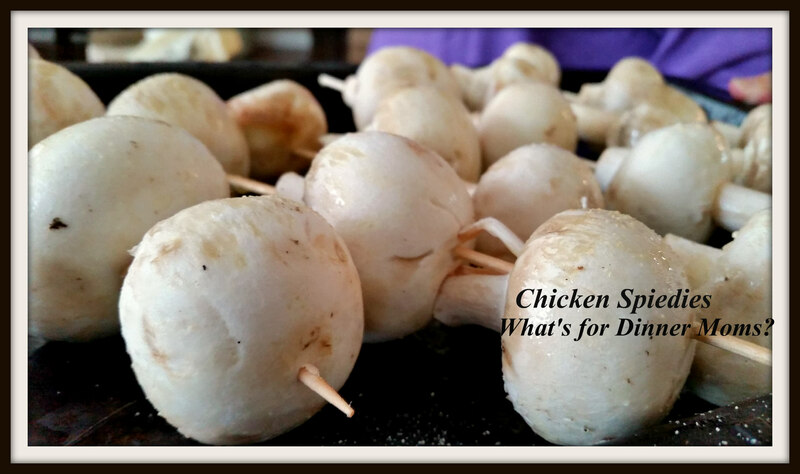 Prior to grilling prepare skewers, if wooden, by soaking them for 30 minutes in water to lessen burning of them. Prepare vegetables and meat by placing them on the skewers (I highly suggest placing one kind of vegetable on each skewer to avoid overcooking or under cooking your meat or burning the vegetables). Lightly brush with oil and sprinkle with powdered garlic. Serve on Naan with tzatziki and feta if desired. Thank you Cheryl! You too! Wow this sounds great! This is a wonderful summer grilling dish, for sure. Thank you! It was only our second time grilling pizza. The first was a disaster. The pizza fell through the grate and made a mess. Much better this time. Should be chicken spied is not pizza! Lol!